Seaton Delaval Dynamos JFC have won their second national grassroots football award in just four seasons. The Northumberland club - whose website is powered by Club Website - have been named joint winners in the Grassroots Club category of the National FA Respect awards, to add to their National Charter Standard Club of the Year award in 2013. 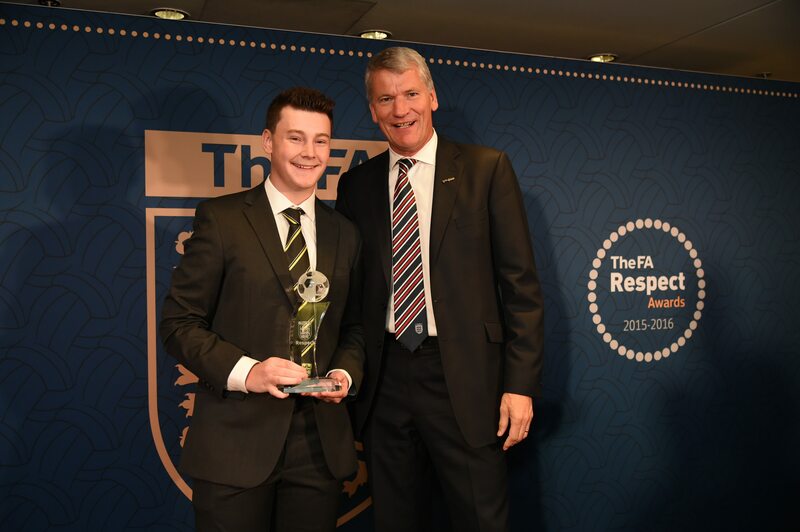 Dynamos' Under-17s goalkeeper and qualified referee Sam Milburn collected the Respect award on behalf of the club from acting FA chairman David Gill (pictured above) at a special awards lunch at Wembley Stadium ahead of this month's FA Community Shield between Leicester City and Manchester United. Members of England's 1966 World Cup-winning team, England manager Sam Allardyce and former Manchester United boss Sir Alex Ferguson were among those attending the lunch, which honoured clubs, leagues and individuals determined to put Respect at the heart of the grassroots game. 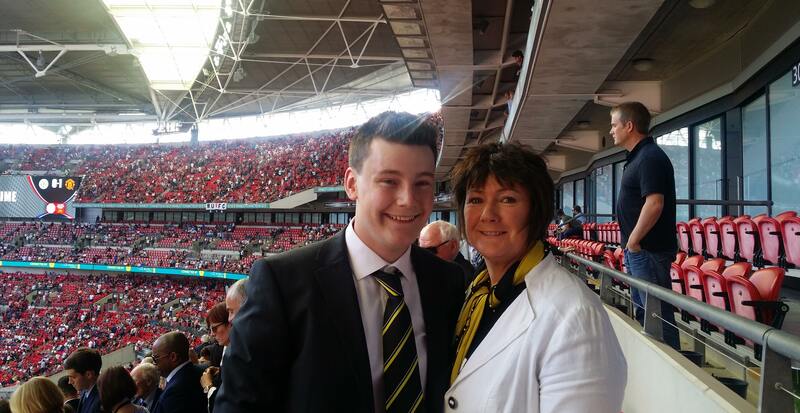 "It was an unbelievable day," said club secretary Anna Milburn, who joined her son Sam at Wembley (pictured below). "For us to meet World Cup winners and such famous names from the game was amazing, plus we got to sit in the royal box to watch the match itself. It was incredible." Anna and her husband Rob founded Seaton Delaval Dynamos in May 2009 to provide a team for their son Sam and his friends to play football. The club, who play in the Pin Point Recruitment Junior Football League, now provides football for more than 80 children across six teams, with new teams at under-11s, under-12s and under-13s ready to kick off the new season. Awarded Charter Standard status in November 2009, the Dynamos have always put Respect at the heart of the club, encouraging good behaviour in players and spectators alike. "One of the biggest reasons kids don't play football is parent pressure from the sidelines," said Anna, who is also a coach and welfare officer. "We go to some games and you can hear coaches trying to coach the children and parents just screaming from the other side. "The kids just want to enjoy the game and play football. It's not the World Cup. Let them go out and enjoy themselves. Let them learn, develop and smile while they're doing it. "Also, there are a lot of young referees dropping out of the game, so we say to the kids on all of our teams: 'Some decisions will go your way and some won't, but without the referee there that game can't go ahead. He's allowing you to play the game you love, so you've got to accept his decision.'" Having been inundated with nominations, the FA selected Seaton Delaval Dynamos for a Respect award for stressing the importance of team spirit, integrity, fairness and enjoyment above an over-arching desire to win at all costs. They have actively supported players and coaches in embedding Respect in everything that they do and even have a Respect motto - Remember Every Single Person Enjoys Coming Today - to help ensure that sportsmanship and attitude are priorities for all of their players. Laurence Jones, the FA’s Head of Clubs and Leagues, said: "The FA Respect winners represent the crème de la crème among an inspirational group of leagues, clubs and individuals. "Each has shown determination to ensure that the game is played in the manner it should be - by instilling and maintaining Respect in the game. It is fitting that those that have excelled over the past season should be recognised for their achievements." The award marks a fantastic achievement for everyone involved at the Dynamos who, just seven years after being formed, are very proud to now have two national awards to show for their efforts in creating a good environment for children to enjoy grassroots football. When presenting them with their National Charter Standard Club of the Year award in 2013, World Cup winner Sir Geoff Hurst said: “The club is focused not only on teaching kids how to play the game, but how to play the game the right way." To find out more about the club, visit clubwebsite.co.uk/seatondelavaldynamos. They are looking for a couple of new players for their under-13s this season. Please contact Anna for details. You can view a short video on Seaton Delaval Dynamos and why they were selected for an FA Respect Award, below, along with a list of all FA Respect Awards and Community Awards winners. Congratulations to everyone at Seaton Delaval Dynamos on their award, which is thoroughly deserved, and to all FA award winners. Grassroots football simply couldn't exist without you! Got a story about your team? We're always on the lookout for interesting stories about the world of grassroots football. If you have a story about your team that you think the world should know about, email a few details to clubnews@clubwebsite.co.uk.